Well hello to you my reader chums, long time no see! I can't believe I haven't blogged in so long, I've literally been extremely busy over the past couple of weeks with mocks and coursework! But I'm back now with topic 3 of the #2014BloggerChallenge which is all about books. If you've been following my blog for a bit, I've done book reviews before and you'd know I love a good read. 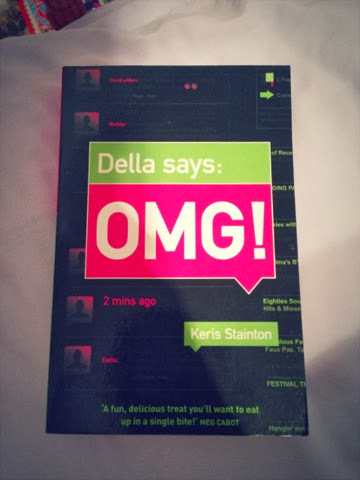 The book I've chosen today is 'Della says OMG' by Keris Stainton. Initially I came across this book as I was randomly searching my name Della in the WHSmith website. I read the description and it seemed like my kind of book straight away! Della says OMG is about Della, a 15 year old girl whose diary goes missing at a house party. Della is a typical teenage girl whose really shy and has a crush on a guy called Dan.The funny thing is when I first read this book I was her age and we had the same colour hair and name! This book is super girly and the thoughts that is talked about is exactly what goes through every girls mind. It's such a relatable novel which is one of the reasons I fell in love with it! I love the way it's been written, it's definitely suitable for a teenage girl as the language used is like day to day speech rather than posh words that some teenage novels have. This book is really down to earth and such a happy easy read, that I would read over and over again. It has your typical best crazy friend and those horrible girls at school that look down on everyone to make them feel better about themselves. When the diary goes missing all Della's secrets begin to be revealed and the person who ended up taking it was so unexpected! I love this girly fun relatable book with a hint of mystery! It has all the teenage worries and it just seems so real. A definite recommend, I love all of Keris Stainton's novels, she's such an amazing author and one of my favourites! I'd totally check this book and her other ones out if I were you. This sounds like my worst nightmare. If my diary went missing when I was 15 it would just be the most horrific thing in the world!! In fact I'm 31 now and I'd still be embarrassed about the rubbish I wrote as a 15 year old making it into the public domain! !